Here is another interresting RC model from GearBest - the Feiyue-03 desert racing buggy . This is a short unboxing video showing what you get and how to get it running. 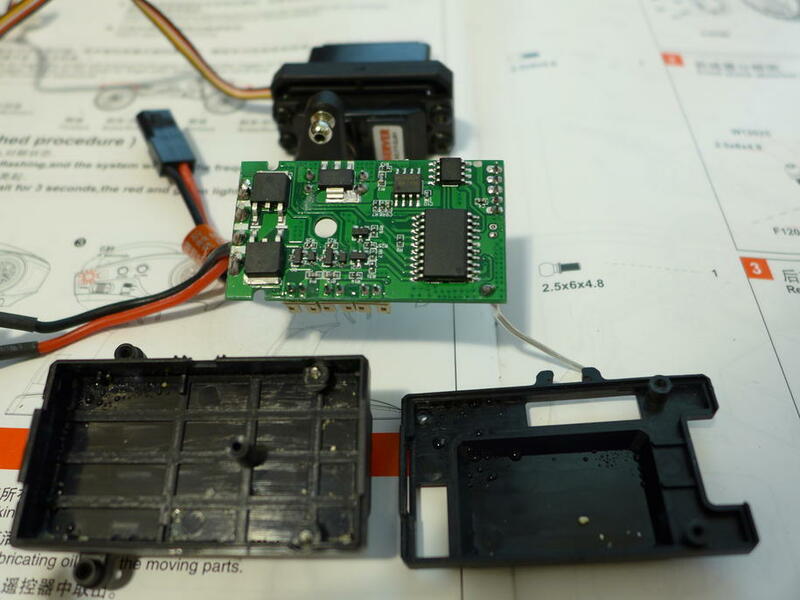 The car came pre-assembled and ready to run instantly again - I only connected car battery plug and put 4 AA cells into the transmitter. After publishing the unboxing video of the Feiyue Desert Eagle-3 buggy , I received a comment I was expecting: "it would have been better if someone was talking about the car on the video". Yes, I've created an "unusual" unboxing video, but it does show the important things, doesn't it? The video shows all you need to do (except removing the car's battery) to make your first run. 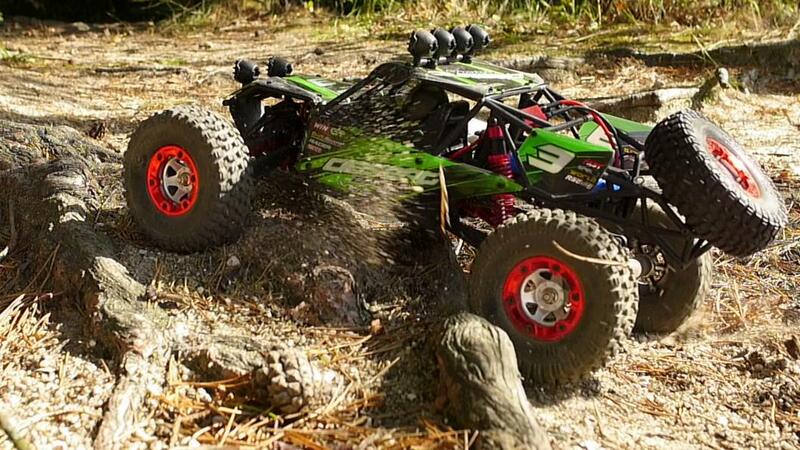 For someone, who has never had an RC car this is pretty simple and hassle-free. The content of the box is not surprising, there are all necessary components - the buggy, transmitter, battery charger, operating manual and a few spare parts. Everything is well packed to withstand transport from e-shop to the end user. Judging from the smashed corners of the box, the transport might have been quite an adventure. But the content was not damaged at all. Even the battery was almost fully charged. When you pull the car from the box, you might get surprised at the first look - the whole car is made of plastic, there is only an absolute minumum of metal parts. The plastic is the same durable one as by the HG P402 . I've talked to a few people about this and their first reaction always was "this must break on the first rock to touch". I can say now, it doesn't break so easily. 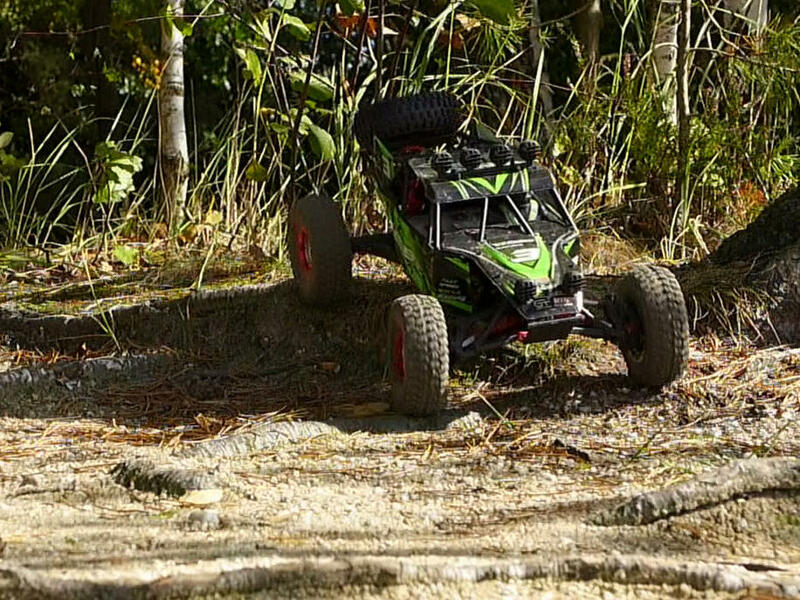 In fact, despite some scratches, nothing happened during the whole filming session of rock crawling with the HG P402 . Both cars are somewhat spongy (in a good meaning) - the plastic chassis can absorb considerable amount of impact without noticable damage. The same applies to cardan shafts and axles - they are made of plastic too. The Feiyue-03 is a fast race car built to withstand long jumps, so we'll see. So far the chassis holds well. The suspension range of both axles is very large. The front axle uses double wishbone suspension with coil springs and shock absorbers are located under the front "hood". 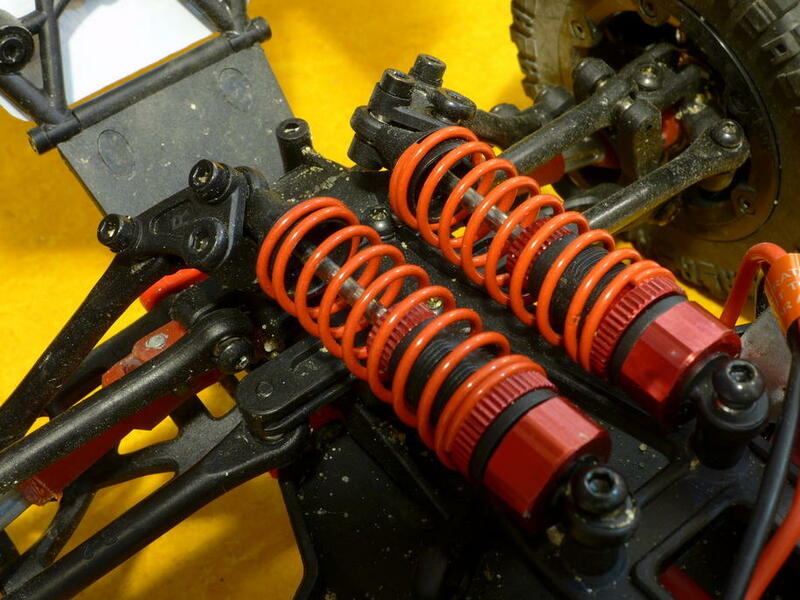 The rear axle is rigid, suspended with coil springs and shock absorbers and linked to body by trailing arms. Both axles have open differentials. There is no inter-axle differential. The car has something like a clutch, which is there to absorb shock to gears caused by rough driving. Under the car, everything is hidden below a flat plastic cover. That's a good design - it helps the car slip over rough terrain and not get stuck. It is good to read the operating manual after you unbox the car. 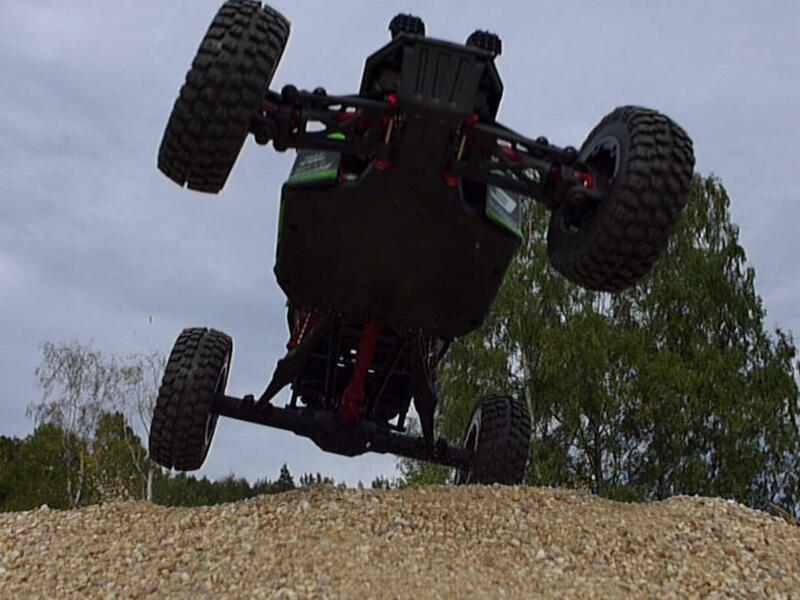 The manual is directed to a broad range of customers - from rookies, who just bought their first RC model, to experts seeking for spare and tuning parts. If you cannot find the car's master switch at the first look, it is in the manual too. Still the switch is on and the battery is disconnected when the car is being shipped (of course to prevent end user frustration, that even though the battery is connected, the car still doesn't run). The battery charger device has a two-colour LED which changes its colour spojite from red (charging) over orange, yellow, greeny yellow to green (charged). That's a cool feature, but I prefer to have just two colors which gives me instant information if the battery is still charging or already charged. The battery shall be connected to the charger via the white (ballancing) connector. The charger is intelligent enough to feed each of the two cells appropriately. The only limitation might be that the charger is slow. The battery is not the same size as by the HG P402 , so I couldn't replace it with a large-capacity battery from my Tatra. Still hard to say how long can it really last. So much for the introduction of the Feiyue-03 and now let's race! When I first saw this car, I knew this was not designed for slow and precise off-road driving. 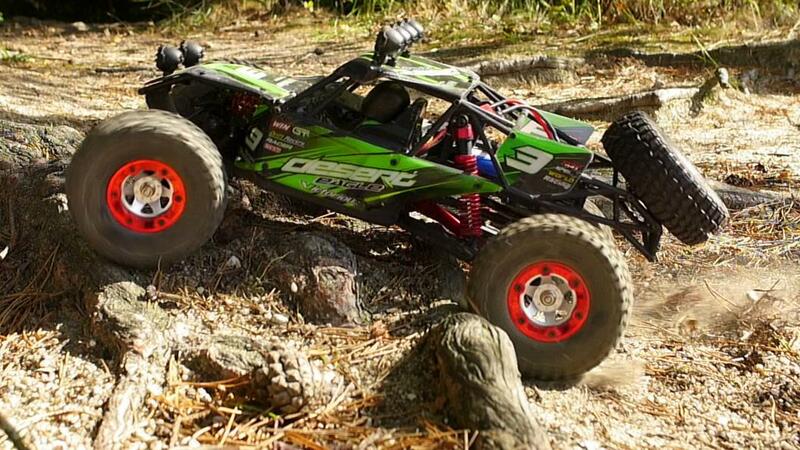 This is a raw off-road racer. It does basically only one thing - to run fast off-road. Even on the box they say it runs up to 40 km/h ... multiplied with scale that's almost 500 km/h! Such a real buggy would be a great and often deadly challenge to most drivers . That's why the whole video is composed of slow-motion shots so that you can enjoy the functioning of the chassis in detail even at high speeds. Water is a major threat - since the Feiyue-03 is very fast and its steering is not absolutely accurate (and I don't have that reactions ), one of the shallow water runs went wrong - the right front wheel got caught by deeper water and the whole car was flooded within a split second. You can see the situation on the video. It didn't look that bad, but you must consider the fact, that the front part of the car is open, so basically a water wave went throught the car all the way over the electric motor, servo and receiver too. The car managed to do a few more video shots, but then stopped completely. Unlike the HG P402 , the Feiyue-03 is NOT a "submarine" and if water gets inside you are in trouble. 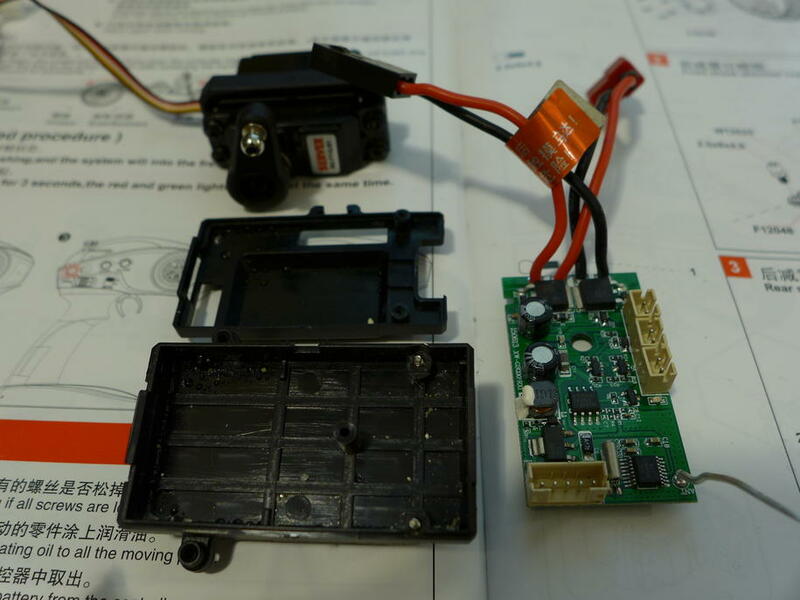 After returning home, I disassembled the electronics in the car including the receiver. When it all dried up, the car returned to normal behaviour except for driving reverse. Now the car does not want to drive reverse at all. If I press the gas lever to reverse position on the transmitter - nothing happens. And no matter whether the sensitivity is set to 50/50 or 70/30. Interrestingly, water has only made the problem worse. When I made my first meters with the car right out of the box, I experienced something like this too - the car didn't want to go reverse a few times. At first I thought this might have been my driving mistake, but the water accident has only made the problem permanent. Has anyone experienced a similar problem? What would you recommend to examine or investigate? Steering - someone asked me if the steering is sloppy - so far I can say, that mechanicaly the steering is designed and manufactured well, the steering joints have no apparent loosenes (yet ), at least on my Feiyue-03 . Steering control has one interesting feature - you can limit the steering lock on the transmitter (the range of the steering servo). The steering geometry changes with suspension travel (this is inherent to independent axle design). The steering servo reacts jerky and has some delay (it stayed the same even after the water accident). Maybe it's normal, I do not know. When you do rock crawling you probably wouldn't care, you drive slowly and have a plenty of time. 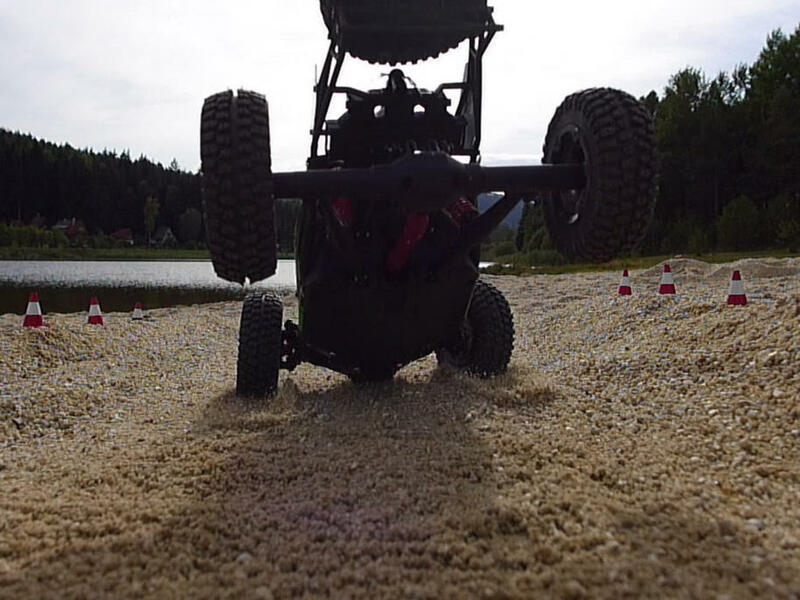 But controlling this "cruise-missile" is rather hard, especially in the rugged terrain of loose sand. It was more like a fight for survival at high speeds. You have a really short time for every reaction, notably when you try to drive to make it look attractive on the video - i.e. pedal to the metal, huge spray of sand flying off all the wheels, car at permanent skid . Therefore, following a narrow path precisely was almost impossible and many runs have had to be made and recorded. The range of suspension is truly amazing, especially at slow motion. The car literaly "glides" over bumps. When I processed the source video footage, I appreciated how the car is well weight-balanced. Every jump it made felt so smooth and natural. The car lands almost everytime on all 4 wheels. That means the front vs. rear weight distribution is nearly ideal for jumping. The battery was able to lasts surprisingly long - video recording of the first part took approx. 1.5 hours (that made 1:40 minutes of final video). Nevertheless, the second part was more about driving at full throttle and the battery emptied after some 40 minutes. Opening the car requires loosening more than 6 screws. Unfortunately, supplied hex keys are made of very crappy material, so be prepared to use your own. There is a slight oil leak in the area of the rear cardan shaft (may be from the clutch or gearbox). That's pretty realistic , isn't it? Damage - both rides were not devastating, the car worked mechanicaly well. I just noticed one thing - left drive shaft of the front wheel is a bit sanded. Closer examination showed that the shaft hits a bottom pin in the axle arm when the suspension hits a bump. On the right side it's not happening. I really like the mechanical design. The car is spongy and it seems like it can withstand quite a hard punch. Jumps are not a problem. Steering servo could have been more precise. Electronics on my car has some problem, it does not want to go reverse. Battery does not last long, I'd recommend buying more and/or higher capacity units. I love the running video, it almost looks like a real rock racer. Was the steering servo jerky right out of the box? Mine is fine with good reaction. Regarding your problem with reverse and not working at all sinds the car got wet, I suspect the receiver / esc. Gearbest sells them too, i have one on the way to do another range mod. About the oil leak, sometimes I find some tiny oil film on the underside of the bottom plate about where the rear cardan enters, then nothing for a day or so and suddenly it appears again. No real drop or something, just a bit of oil film. I guess you already saw this thread? Alias_Hendrik: thank you for your comment. 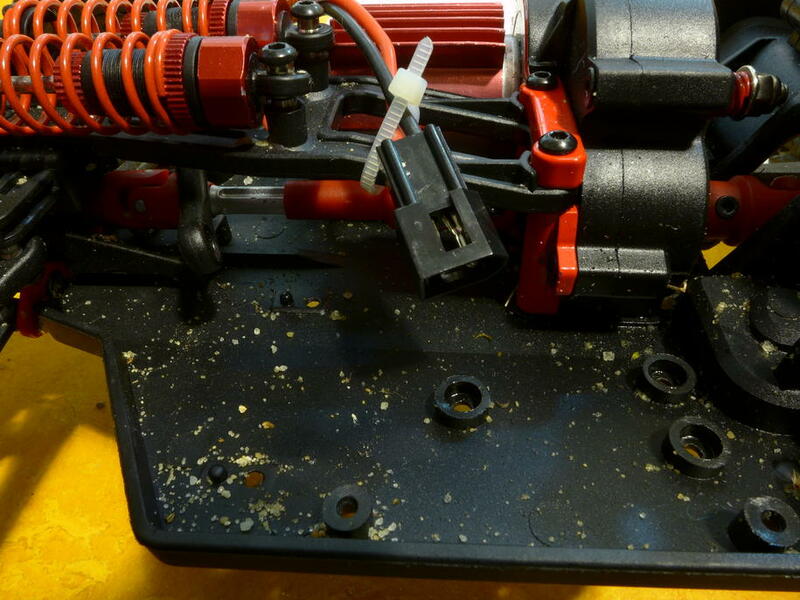 Yes, the servo was a bit jerky right out of the box, it didn't change with the water accident. But it is only jerky one-way - when the wheels steer more. The other way - when the wheels return to straight position - the servo reacts smoothly. Reverse: I suspect the receiver too, some settings got erased by water connected some pins on one of the integrated circuits I suppose. 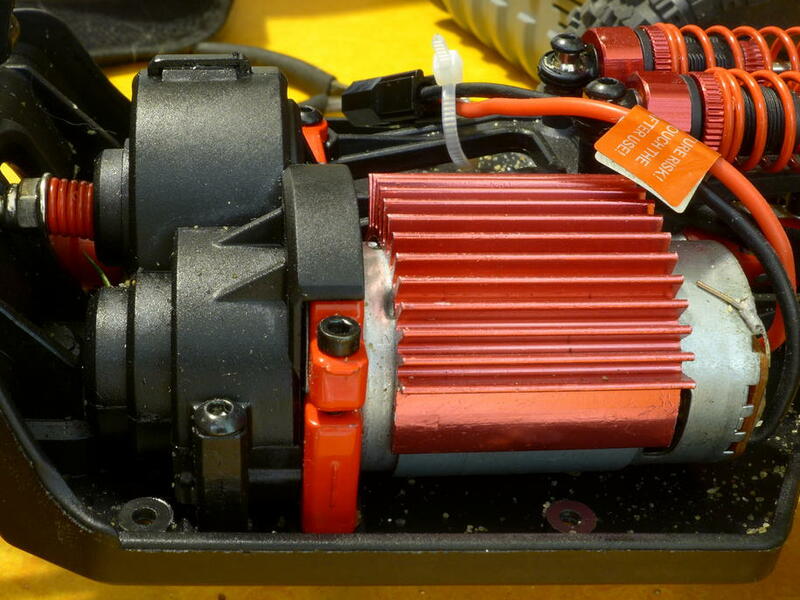 The electric motor is fine. Oil leak: yes, it is exactly as you describe it. Since I'm used to oil leaks from all diffentials and gearbox on my Tatra 130, I find it as a neat realistic feature on the Feiyue too . As many people say: when there is no oil leak from an old Tatra (and/or Land Rover too), there is no more oil in it . And yes, I saw your thread too, I read your review in detail and watched your videos when I received my Feiyue. Good job btw! Great review and vids, thank you. I ordered this for my 10 year old son for Christmas from Gearbest not realising it didn't come with a battery and charger. Stupid dad, huh! Anyway, which battery and charger combo would you recommend? Needs to be safe enough for a (smart) 10 year old to learn how to do it safely so I'm not sure about LiPo...maybe following strict instruction, use charge bags it's not an issue? Really? Mine was complete and ready to run - with battery and charger. In this case there is a little problem with battery size - the rear part of Feiyue-03 is designed for a two-cell Li-Po (or equivalent size). That's the only limitation I can imagine here. The battery must give ca 7.4V and must fit inside. So try to look at your local rc-model e-shop web pages and find something with the right size, voltage and connector type. Regarding safety: I use NiMH 6-cell packs for my RC truck (not the Feiyue), in fact I started with NiCD pack almost 9 years ago. With the right charger (that understands the battery electrical characteristics) I never had any problem even during fast charging on model shows. Btw, my NiCD worked flawlessly for 7 years, then one cell died and thus the battery didn't have enough voltage. The problem with NiMH is lower energy density compared to Li-Po or newer technologies. I never used Li-Po batteries too much, but my colleagues who use them, store them in a safe place (e.g. in a fireplace). Your son will love it, Ive just had to order one for mine so I can have mine back!! At first,I saw you review of HG P401.I think you review word, picture and video is pretty nice. So I find the your other review.Honestly,I must say the FEIYUE-03 looks so great.I also want to hold one.It is my inner heart voice,But the shipping price has little expensive. Could you tell me your cost of receiving this good?I also want to know how to make this nice video. Problems with feiyue eagle 03!!! 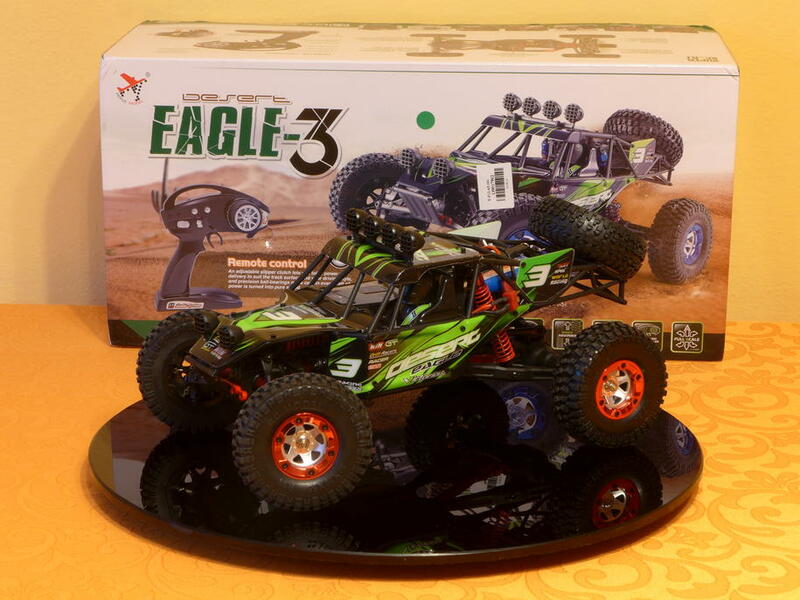 Hey guys I'm new to this site, but I recently have bought an eagle 03, and the steering is like off it came out of the box with one wheel straight and the other is turned to the right slightly. Have no clue how to fix that or if it even fixable! And I have ran it tried messing with the steering trim but that was no hope. Hope u guys can see it in the pic, it's the right side front tire. That's normal cos i have mine like that, its design to get better steering during off-roading and cornering. This is called "toe-out". If inwards its good for drag-racing or straight line performance.